I adopt new technology pretty quickly and digital books are no different. I made the move to reading novels on the iPad months ago and with DC’s new reboot, I decided I would buy those electronically, too. (The exceptions being WONDER WOMAN, BIRDS OF PREY and BATGIRL, which are purchased as in both formats because they were already on my pull list at the comic shop. Besides, I have to buy some print because I still want to support my local comic shop.) For me, ebooks make sense because I have a preteen daughter who is very involved. I live in one city while I teach in another and we also give back to our community. We are very busy people. Hauling print comics all over God-and-country is just not prudent anymore. I didn’t intend on looking at so many of the DC books to begin with. ACTION, DETECTIVE, and a couple more were all that I wanted to see. As the books come out I cannot help but be intrigued. Much of what I’ve read so far has been pretty solid. That means I end up downloading more than I expected. Good thing, because the print copies are selling out and I’m not paying more than cover price. ANIMAL MAN #1 is a comic I would have never picked up had the buzz not been so good. The writing is outstandingly slow and character driven, something we need more of in our lit and flicks. 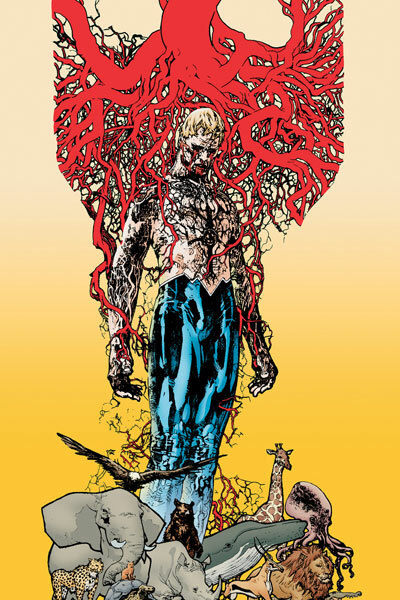 Animal Man has the ability to tap into the life web and access the traits of any animal. He is married with children and is more interested in family life than that of the daily super, although he dons the costume now and again to fight crime as well as make some public appearances and do the occasional interview. Deep down inside something is wrong –– very, very wrong. The last panel is creepy and gives students ample fodder to examine, analyze, synthesize and make predictions. What is going on with his elementary-aged daughter? If they can get past the craziness of the situation, they will not be able to wait for the next issue. I would consider having students write their own issue #2 (text, art or both) and see what they come up with. As good as the writing is, the art is very dated and a pretty big turn-off for me. If the story were not so good, I would probably drop it after #1. 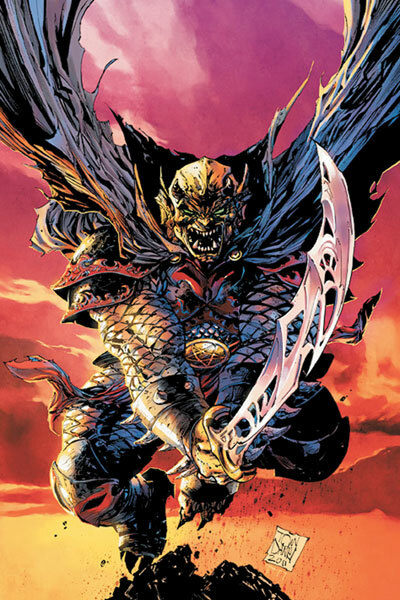 DEMON KNIGHTS #1 is a magical, medieval fantasy world with dragons, demons, and barbarian hoards. Flashbacks and multiple story lines make it a book worth reading twice, and for those students who love full blown fantasy, DEMON fulfills nicely. A graphic organizer to track the multiple story lines would help students keep it straight and analyze the motivations of the characters and make predictions as to the future. Bloody and demonic, if DEMON is used in the classroom, it needs to stay with older teens and college students. It may be more beneficial as a library check-out. I see DEMON being used as a relationship builder between teacher and student, where a recommendation is made to that special student who needs that special kind of fantasy. 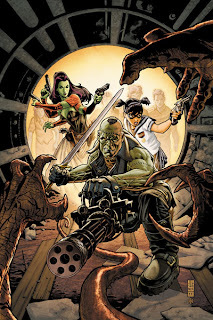 FRANKENSTEIN, AGENT OF S.H.A.D.E #1 is –– it seems to me – DC’s version of HELLBOY. The art is different, but the creatures and set-up is very similar. Soldiers volunteer for a special program to become something less human. Franky was the first, but now the program is expanding to a vampire, werewolf, mummy and amphibian. The team’s job is to destroy the evil hoard of monstrosities that have invaded a town. FRANKENSTEIN is a bloodbath of fighting and defending. Like DEMON, I would see it as a piece to be recommended to those students who need more alternative stories than the school library might provide. If you can’t tell from the title, this is a mature, grown-up story line; it is not for kids or for the K-12 classroom. While college students are mature enough to handle it, it’s still too soon to tell how it might be used effectively. SUICIDE is nothing more than SECRET SIX with new characters. Those who liked SECRET SIX will slide right over to SUICIDE and find a home. What I find confusing is why DC would stop one and start another so much like it. It makes no sense, really, because SECRET SIX had a following. SUPERBOY #1 was quite the surprise piece for me. I didn't think much of it at first glance, but finally decided to download it on a hunch. 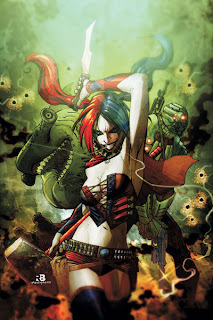 Scott Lobdell’s approach to writing is similar to Gail Simone. His characters are reflective and there is a lot of narration giving us insight into Superboy’s mind. Who is he? He is a lab-created clone with hybrid DNA. Superman’s DNA was combined with someone else’s DNA, but who that is the great secret. It plays an important role as the person is obviously controversial. Lex Luthor seems to be the prominent pick of fanboys. There are clues a’plenty in the book, in both text and art. This works well to teach students to “read the pictures” as well as the text in order to gain insight into the whole story. One scene depicts Superboy in a classroom in Kansas. I noticed the spinning wheel computer icon in the middle of the page. It stopped me and I wondered why it was there. I suspected he was being observed. That was partly true, I suppose. The reveal comes later in the issue. I won’t spoil it, but I will recommend making students stop and discuss why that icon is in the middle of the page. What does the icon tell us about the story? How does the author use this detail to tell the story? The last panel of the comic offers another chance for students to meld the text and images in order to construct meaning and make predictions about the next issue. This is purposeful on the part of the creators. It’s important for teachers who use comic literature to teach students to see those clues, interpret them and discuss them. 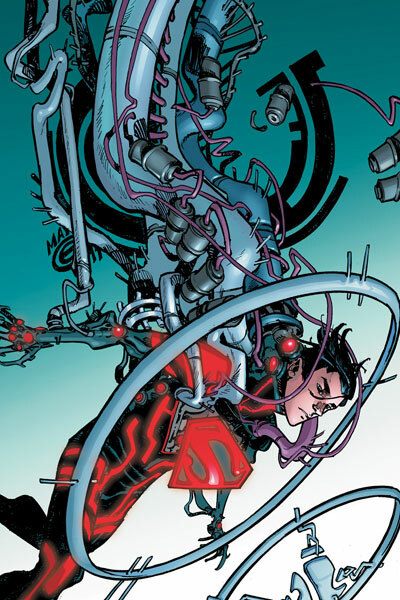 Superboy is a walking metaphor. He must hide himself –– his true self –– from everyone in order to fit in. He’s concocted a story of cognitive amnesia so he doesn’t have to explain his history. The scientists watching him are perplexed by his apparent flat affect and lack of empathy. For teens, Superboy offers a lot in the way of understanding their world through literature while examining the larger picture at the same time. How does the reader view him? Are we concerned, too? How will his less empathetic characteristics affect his superhero life? Do parents, teachers, counselors and other adults look at teens the way the reader or the scientists look at him? What do they see in the teens' lives that the teen and his or her peers do not? I think SUPERBOY might well be that one title that is a must for middle and high school students. My first hack at WONDER #1 left me a bit underwhelmed. I was utterly irritated over the cover art. [shudder]. Something about being disappointed with the reboot of one of DC’s iconic characters didn’t sit well. Was it her or me? I think my disagreement with the cover art nearly spoiled the new series for me. I grabbed the iPad again and really combed the title out. What I found was a deeply complex narrative structure similar to the movie trappings of writer/director Quentin Tarantino. That was it. I missed the chopped up and reorganized timeline on my first read. I wasn’t bored and I wasn’t disappointed. I just didn’t get it … the first time. My second read brought the Amazon home with a gut-punch and a smile. I picked up on the clues regarding the mysterious, oracle-inducing rooftop sun king and finally understood the disharmony between narration boxes and the visuals during Diana’s battle with the assassins. The things I missed are the things that students should examine. Rearranged story lines as well as foreshadowing and other clues are prime ways to teach students to appreciate complex titles of any mode. Studying non-linear storytelling helps students write creatively. 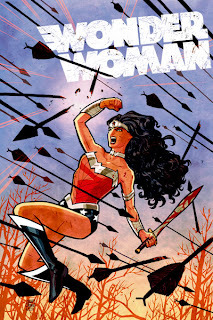 WONDER #1 was my favorite storyline so far in the new DCU, but it requires a thorough read and an inquisitive mind for the real gems to sparkle. Perfect way to teach students about non-linear story telling and creative narrative structure. Next time we will wrap up the series with the low-down of a few other titles I had no plan to read, but ended up buying anyway.